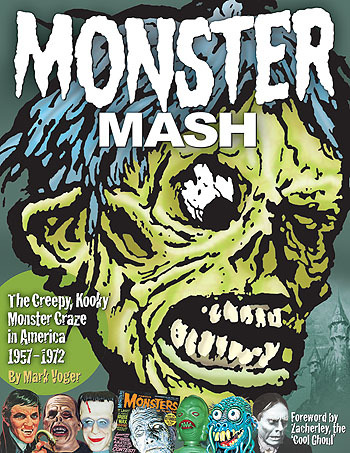 This week, we’re shipping Monster Mash, author Mark Voger’s outrageously fun book on the Monster Craze of the 1960s. If like me, you grew up building the Aurora model kits of Frankenstein and the Wolfman, or stayed up late on Friday nights watching Shock Theater’s rerun of old Monster movies, you will absolutely love this book. Don’t believe me? Check out the free preview we’ve posted HERE. It’s a full-color hardcover, beautifully designed, with hundreds of images and interviews with everyone from the cast of Dark Shadows, to Ed “Big Daddy” Roth. This entry was posted in TNT on 29 June 2015 by Mr. Morrow. All back issues of BACK ISSUE magazine are on sale for 40% off, now through July 1. So complete your collection while the savings last! This entry was posted in TNT on 25 June 2015 by Mr. Morrow. It’s a big day today at TwoMorrows, with these three new issues NOW SHIPPING! JACK KIRBY COLLECTOR #65 goes all-out and all-in with our Anything Goes (Again) issue! This new potpourri issue covers anything and everything from Jack’s 50-year career, including a head-to-head comparison of the creative genius of Kirby, against the design expertise and ALEX TOTH! Who will come out on top? 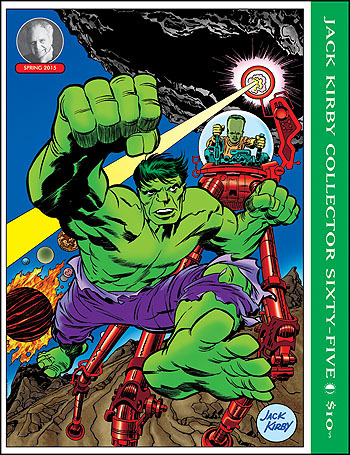 Plus a lengthy Kirby interview, a look at Kirby’s work with WALLY WOOD, MARK EVANIER and our other regular columnists, unseen and unused Kirby art from JIMMY OLSEN, KAMANDI, MARVELMANIA, Jack’s COMIC?STRIP & ANIMATION WORK, and more, all behind a classic 1960s cover inked by KIRBY?himself, complete with our gorgeous new color printing. Edited by John Morrow. 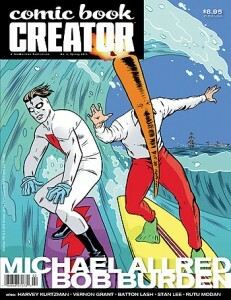 Comic Book Creator #8 is double the fun with two main features—MICHAEL (iZombie) ALLRED and BOB (Mystery Men) BURDEN—who share a surf-crazy jam cover featuring their respective creations, Madman and Flaming Carrot hanging ten! Comprehensive interviews and art galore await as we respectively visit these two innovative and individualistic creators. Plus BILL SCHELLY is interviewed about his new Harvey Kurtzman biography, and we present the conclusion of BATTON LASH’s career-spanning interview which discusses his Supernatural Law series. We also join STAN LEE on The Man’s last European comic convention tour… and HEMBECK! Edited by JON B. COOKE. BrickJournal #35 (84 full-color pages, $8.95), the magazine for Lego enthusiasts, goes back in time to look at History in Bricks! 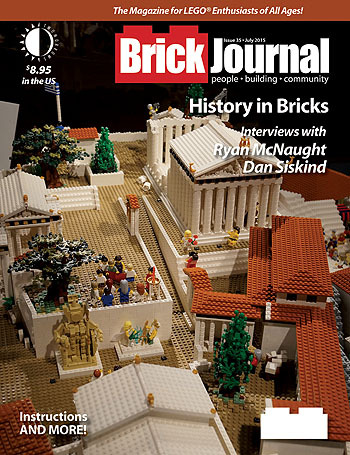 We’ll talk to LEGO Certified Professional Ryan McNaught about his LEGO layout of Pompeii and his many other projects, military builder Dan Siskind about his work and business selling custom models at BrickMania, and Lasse Vestergard about his historical building. Plus: our regular feature on Minifigure Customization by Jared K. Burks, more step-by-step “You Can Build It” instructions by Christopher Deck, DIY Fan Art by Tommy Williamson, MINDSTORMS robotics lessons by Damien Kee, and more! Edited by Joe Meno. Click the links above to see a free preview, and order! 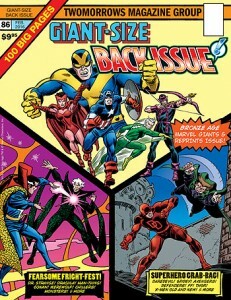 I love, love, LOVE those great DC Comics giants and reprints of the 1970s, especially the 100-Page Super Spectaculars. 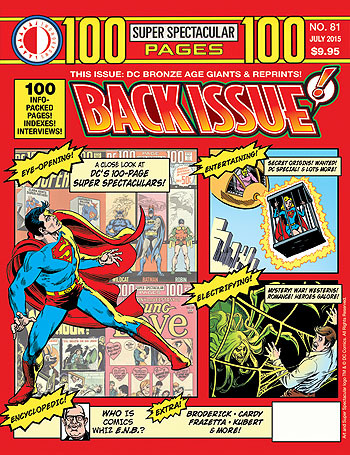 And the new issue of Back Issue (#81, shipping today from us and in stores next week) spotlights those big beauties. Editor Michael Eury and his band of faithful contributors have created my new favorite issue of BI (previously it was #61, our tabloid-size issue on DC and Marvel tabloids and treasury editions—and that one quickly sold out, so I wouldn’t wait to pick up #81 if I were you!). This expanded 100-pager (natch!) has a one-time price increase to $9.95, but it’s worth every penny. Of course, nothing in this world is perfect, as you’ll see when you get the print issue in your hot little hands. It was originally planned to cover both DC and Marvel giants, but Michael soon realized that, even with its 100-page expanded size, he needed much more space to do them both justice. So he opted to give Marvel giants their own issue, #86, shipping in January. But in the frenzy to get this oversize issue to press, I accidentally used the original version of the cover that mentioned Marvel giants, instead of Michael’s revised cover that was all-DC. So please ignore the Marvel blurb on the printed copies, and look for the all-Marvel giants issue early next year! This entry was posted in TNT on 10 June 2015 by Mr. Morrow. The new issue of Alter Ego (#133) is shipping today (and in stores next week), and features Gentleman Jim Mooney in an extensive interview, never before published. 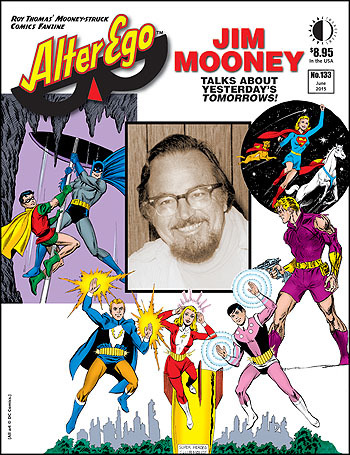 He discusses his storied career, including his work on Supergirl, Batman, Dial H for Hero, and the Legion of Super-Heroes, an all-time favorite of mine. The issue also features FCA (Fawcett Collectors of America), Michael T. Gilbert in Mr. Monster’s Comic Crypt, Bill Schelly’s Comic Fandom Archive, and more of the amazing discoveries on comics history that have netted editor Roy Thomas’ mag another Eisner Award nomination this year. You can see the preview and order it HERE. This entry was posted in TNT on 3 June 2015 by Mr. Morrow.